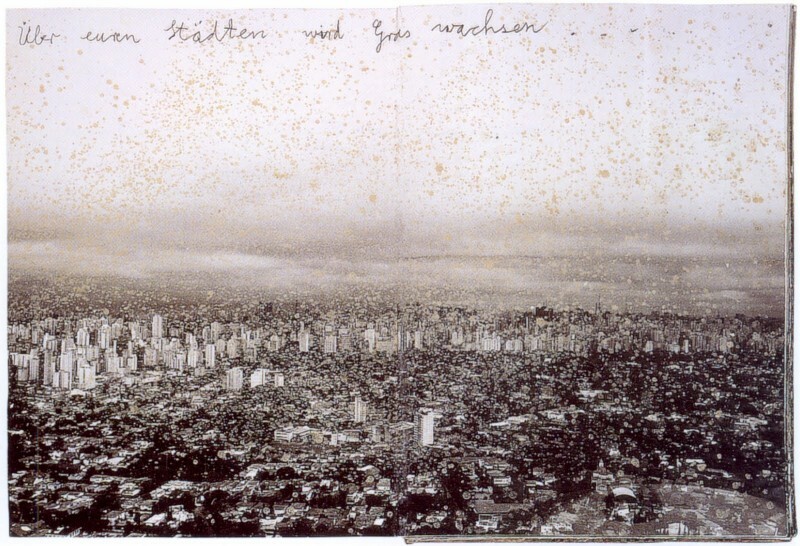 Anselm Kiefer’s image of a city covered in sand (or are they ageing spots?) seems to be frozen in a past time. It shows a faded urban landscape, where the buildings blur into a grey horizon. It is hauntingly beautiful, but the reason I would take it to foreign world is not for its beauty, but for the message that’s written, almost as an afterthought, in the sky. Sometimes in dealing with the past, people struggle to envisage a hopeful future. Inherent to Kiefer’s works, and also to the German pysche, is a contemplation of Germany’s history. However, it’s important to remember that this series was created in the 90s. The war had ended over 40 years earlier, so the image is a blurred memory of German history, mirrored in a blurred landscape. It evokes a distant trauma. In the years since 1945, German cities have had to rebuild themselves, and confront their past. We see this in the sand, straw and rubble on Kiefer’s canvases, which the artist uses to evoke destruction and creation in equal measure. Kiefer’s works are renowned for their vast scale and emotional power – both of which I had the pleasure of experiencing first-hand at the Royal Academy in London recently . Until December 14th they are exhibiting a huge collection of of his works, although unfortunately this particular piece does not surface. This delicate work is more subtle than the overwhelming ones on display at the Royal Academy, but, for me, no less moving. There are no blood splatters, ominous figures or weapons. In fact, I only came across it when I was pretending that I could afford to buy the art books in the gift shop after visiting the exhibition. In a different, less explicit way, it is just as relevant to our understanding of the war in retrospect. Admittedly, I would be grossly lying if I said that I immediately felt the suffering of a post-war German generation looking at the work (turns out having the surname Müller isn’t quite enough to do that). But it still comes across to me as so much more than just a photograph of some buildings, and just as meaningful as Kiefer’s manifest holocaust artworks. It shows me that the past inevitably fades, and we can hold on to the thought that the future can be better. The translated German writing at the top, ‘Over Your Cities Grass Will Grow,’ is a voice of hope. It looks over a cold urban metropolis but predicts that nature will intervene. With the context of Germany’s tumultuous history in mind, this phrase is particularly poignant. And the thought that grass, life, and creativity continues after destruction would surely console anyone on their own, stuck in a strange land. Anisha is a German and History of Art student at UCL. When she was younger she wanted nothing more than to be a window cleaner, but nowadays she’s content with passing the time with reggae aerobics, salsa and making art whilst listening to feminist audiobooks. She also has an obese cat. I read this article and found it very interesting, thought it might be something for you. The article is called Flying Sands – #anotherearthart and is located at http://prancingthroughlife.com/2014/11/11/flying-sands-anotherearthart/.